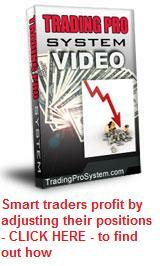 The ratio calendar spread is a nice trade setup with unlimited profit potential and a low risk profile. It is no different from the traditional calendar spread, except that you purchase a greater number of options with a later month expiration date than the front month options that you sell - hence the 'ratio' of bought to sold options. The ratio calendar spread is ideally suited to markets which are either consolidating, or you expect future price action in one direction of other.The beauty of this type of setup is that you make some profit if the stock goes nowhere, more profit if it moves in the direction you anticipate and you can even realize a little bit if it goes slightly against you. The worst case scenario is when the underlying makes a big move against you, but even then your losses are limited and you may be able to alleviate the damage by selling future month options until the the long dated ones expire. The total cost of this trade will be (900 x $1.28) - (600 x $0.84) = $648 plus brokerage. We then observe our risk graph below. The red line indicates expiration date and the white the current date. We note the following. What the risk graph doesn't show is, is that at April expiration date, we may then have the opportunity to sell another 6 May call contracts, then later, 6 June contracts, followed by another 6 July contracts. The combination of these 4 call option sales may offset the cost of the original July purchased options, providing the price of the underlying hasn't fallen so far that the prices you would receive become insignificant. Another good thing about these spreads is that there are no margin requirements, since there are more bought options than sold ones. Your risk is limited to the initial debit. Ideally, you would like your sold options to have greater implied volatility than your bought ones, taking advantage of a small volatility skew if possible. The conditions under which this is most likely to occur, are immediately after a stock has made a significant move in either direction. For example, if Intel had just dropped 10 percent in a short time on high volume, the near month call options would mostly likely be overpriced. So at this point you sell your April and buy your July contracts as above. You don't need the stock to bounce quickly; you simply rely on the fact that after the price move it should consolidate for a while and possibly recover in the longer term. Either way, you make a profit. 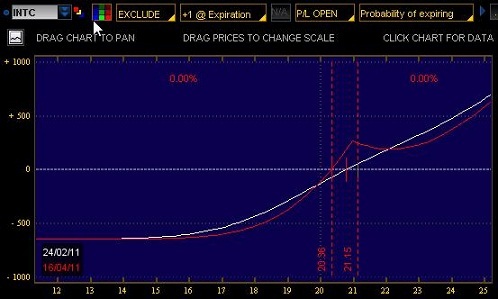 The same works in reverse for a ratio calendar spread, using put options. After a large move north (e.g. after an earnings report or news event) you expect the stock to consolidate for a while, then retrace a little. If you have a good options broker, you can use their online tools to scan the markets for stocks with such parameters. With a little imagination, it may be possible to implement a double ratio calendar spread using both calls and puts. You may need to experiment with exercise prices and number of contracts to get the most appealing risk graph here. Think of it as a kind of low risk straddle. Using our Intel example above, with $22 calls and $20 puts, your maximum loss would be about $200 and your profit on either side at April expiry is potentially unlimited. You also then have May, June and July options to sell on either, or both, sides.